I love quick meals. I especially love meals that are quick and tasty. Sometimes, with seven different people to feed, it’s hard to find recipes we all love. I originally found this recipe years ago (on the back of a soup can maybe? I really can’t remember.) and it has been in our keeper binder since then. 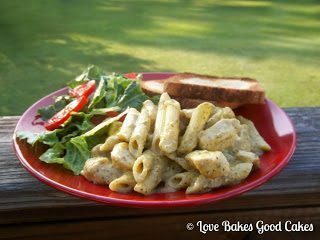 Served with a salad and garlic bread, it’s an easy and flavorful weeknight meal the whole family will enjoy! Meanwhile, in a large skillet, cook chicken in butter until browned, stirring often. Add soup, pesto and milk. Bring to a boil. Cook over low heat for 5-7 minutes or until the internal juices of the chicken runs clear. Stir in pasta and heat through. *** To make condensed soup substitute: Melt 2 tbsp. butter in a saucepan. Stir in 3 tbsp. flour and stir until smooth and bubbly. While continuously stirring, add 1/2 cup chicken broth and 1/2 cup milk. Bring to a low boil, continuing to stir until it thickens. Salt and pepper to taste. Use in place of canned cream of “whatever kind” of soup. You can also add herbs, celery or mushrooms. This looks delicious! Doesn't it make a pretty dish! I just posted an easy recipe also! I love to have quick recipes for my busy days, also for my "I don't wanna" days! Jamie,I know what we are having for dinner tonight now. I have been baking all morning and thinking what can we have for a change for dinner. I like to prepare it in the morning to save time. This is ideal as I have a cooked chicken in the fridge at the moment so can adapt it. This pasta looks yummy and super easy! I love that. Thanks for linking to Tempt My Tummy. 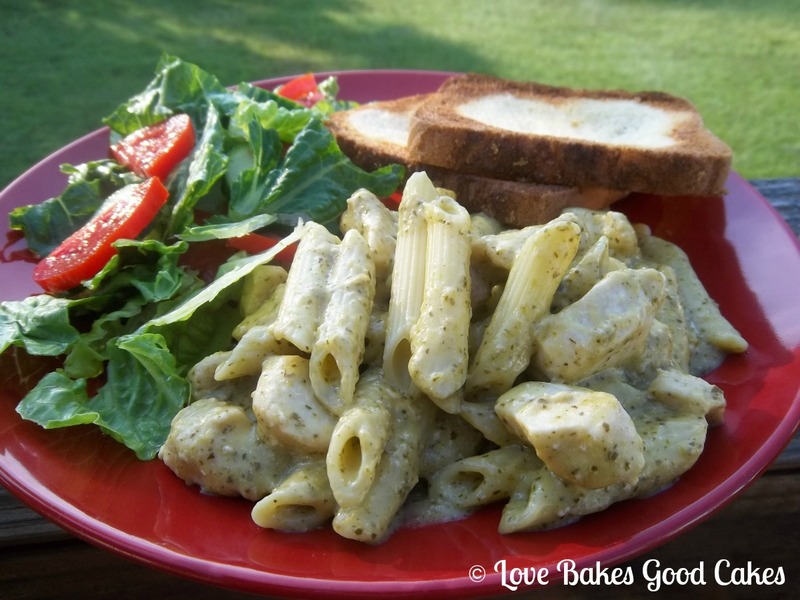 Awesome weeknight family dish, Jamie! Thank you for sharing. What a great quick meal. I have cream of mushroom soup… have you tried substituting? I will pin this. This looks perfectly scrumptious! Thank you so much for sharing at Mom On Timeout. Hope to see you back tonight! Thanks for sharing on Foodie Friends Friday.. I am just getting through last week's post and I hope you join us again this week.